One of the best reality shows on television is Top Chef, because it forces its contestants to think on their feet and cook food under the most dire of situations. But the producers last week tried to get a little too cute for their own good, and it very well could have put the fire out on what was arguably the best season ever to that point. Top Chef: All-Stars (Bravo, Wednesdays, 10 pm) is a compilation of some of the best contestants in the show’s history, so we knew we were going to be in for some very heated battles. Coming back to show to prove they belonged among the best of the best, and most of them were known to fans simply by their first names (such as Angelo, Fabio, Marcel, Casey, Carla, Tiffany, Richard, Mike, Tre and the two Dales and two Tiffanys). And one of the best parts of the show is when the chefs are thrown curveballs to see how they adapt to time constraints, limited equipment and unique ingredients. Unfortunately, sometimes the show can get a little too witty for its own good, and it backfired big-time this past week in what was billed as the first segment of a four-part finale in the Bahamas. First, in the Quickfire challenge — a timed contest in which the chefs can win a significant amount of money —several of the burners weren’t working properly. It was tough enough to cook a dish outdoors, but it was made darn-near impossible and unfair when everybody wasn’t cooking with proper equipment. That almost seemed tame by comparison, though, to the debacle the chefs faced in the ensuing elimination challenge. After being told that they would be cooking for Bahamian royalty, most of the five remaining men/women chose to cook food literally fit for a king and queen. But when they arrived with the food they had prepped thinking they would be cooking in their dream kitchen, they were instead introduced to the King of Junkanoo (an imaginary title similar to something you’d find in a Mardi Gras parade) and led to to restaurant that resembled a shack more than a palace. At this point, I’m sure the producers were feeling pretty clever, because they had successfully duped the very people who make their show popular. And that’s when things literally went up in smoke. Instead of having nice ranges and ovens to prepare the food they had brought, they were stuck with toaster ovens and fryers — one of which caught fire, thereby forcing an evacuation by the fire department. 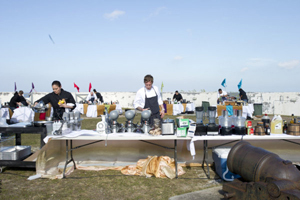 The competition was postponed due to the food being contaminated, and all of the chefs were forced to regroup and do the challenge all over again from scratch. Head judge Tom Colicchio at first seemed to be justifiably apologetic for the embarrassing production gaffes, but then he covered the show’s bases when he said that great chefs are able to adapt to the worst of conditions. That may very well be the case in real life, but the rules should be different on reality TV. As viewers we expect and demand a level playing field for all contestants, and we got anything but that in this episode. Perhaps Carla did deserve to go home last week, but we will never know whether it was her cooking or the subpar conditions that led to her being forced to pack her knives and go. All in all, it really was a pretty forked up situation.